Indian runner ducks are a breed that began in the East Indies. Rather than waddling, they run. While they do look somewhat like ducks, they have bottle-shaped bodies, with the feet farther back than those of traditional ducks and a much more upright posture. Indian runner ducks were first brought to England in the early 19th century and spread to Europe and America from there. Besides their unusual shape and gait, Indian runner ducks are very prolific egg layers. Up to an egg a day per bird is not unusual for a healthy one-year-old duck. Another characteristic that makes them especially valued as egg layers is that they rarely go “broody.” This is a condition when a female bird, regardless of the presence or absence of a male, determines to sit on a nest. Anyone who has tried to deprogram a hen that has gone broody knows how convenient it would be if that condition never occurred! Not only are Indian runner ducks more upright than the ducks most people envision, they can be bred in a dizzying variety of colors, including blue, white, black, fawn, chocolate brown, mallard (green), silver, and apricot. Their eggs are similar in size to a large hen’s egg and may be blue, light green, white, or cream colored. Indian runner ducks are light eaters, too, and their favorite foods are those that they forage for, such as slugs, worms, insects, grass, and other wild greens. So good are they at foraging that some farms keep and breed them for the sole purpose of natural pest control. But in the absence of such wild food, they are happy to eat duck pellets, too. 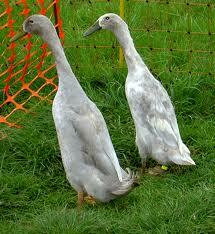 Most Indian runner ducks will begin laying eggs at around six months of age. If they don’t begin laying by eight or nine months, there may be an easy to correct problem. If they are fed egg pellets or crumble, it has all the nutrition these birds need. A little scratch each day is good because they think of it as a treat and they have to scratch around for exercise. But a diet primarily made up of scratch is not healthy because it isn’t nutritious enough. The Indian runner ducks, particularly hens, need to have sunlight and fresh air each day. Dry ground, shelter from wind, and a place to roost at night are also essentials, as is a constant supply of water. They may stop laying in fall and winter once the days become too short. This is easy to remedy by putting a light in the coop and having it on a timer to be illuminated from 5 in the morning until 10 at night. But it is also important to turn the light off overnight. Indian runner ducks are not only fun to observe, they have much to offer to those who like to keep small fowl and those who need help keeping the insect population down. Though they originated in Malaysia, they are now a favorite duck breed in many other parts of the world as well.